Angela Goodwin is the friendly founder, director, and principal teacher at Yoga Bradford. Angela believes that yoga is for everyone and understands that everybody’s journey is different and this individuality should be nurtured. Yoga Bradford classes have a relaxed, informal atmosphere to provide nourishment for the body and soul! Every great journey starts with the first step and Yoga Bradford want to help you find your yoga path. Angela was first drawn to Yoga in because it offered a welcome inner sanctuary away from the stress and anxieties of hectic life. Angela has a first class BSc (Hons) in Psychology and enjoys exploring the similarities between Mindfulness and Yoga. Mindfulness increases awareness, clarity and acceptance of our present-moment reality by paying attention in a particular way: on purpose, in the present moment, and non-judgmentally. This mindfulness approach can help combat anxiety & depression and is one of the underlying principles of yoga practice, which directs focus to the breath and body to provide a moving meditation. Angela has been practicing yoga since 1998 and completed her teacher training with Brian Cooper (PhD) and Nichi Green in 2013. 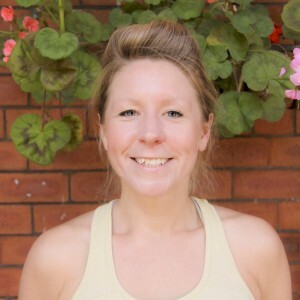 Angela is an experienced practitioner of Ashtanga yoga, studying with and assisting Joey Miles at Ashtanga Yoga Leeds, which has also provided firm foundations for her practice of Vinyasa Flow yoga. Angela has attended workshops/training with internationally recognised teachers David Swenson, Tim Feldman, David Garrigues, Eddie Stern, Stu Girling, Esther Ekhart, Granville Cousins and Durga Devi.